1. Heat the oil in a large saucepan and cook the onion and chicken for 5 minutes until the onion has softened. Stir in the celery, carrots, potatoes and tomatoes and cook for 5 minutes, stirring frequently until the tomatoes are pulpy. 2. Stir in the stock and curry paste, bring to a simmer and cook for 20 minutes until the vegetables are tender and the meat is cooked through with no pink meat. 3. Remove the pan from the heat. Ladle half the soup into a jug and add the chutney and yogurt. Using a handheld stick blender, whizz the soup in the jug until coarsely puréed and add back to the pan. 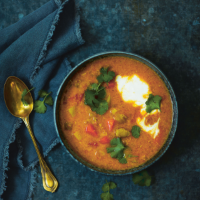 Ladle into 4 bowls and serve topped with a spoonful of yogurt and scattering of coriander leaves. For added crunch, scatter crushed poppadoms all over the soup just before serving.